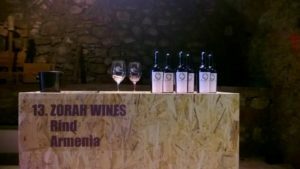 In our January Newsletter, Zorah Wines of the company from Rind in Armenia, told Artenova its history: in the year 2000 they began to acquire small plots of land at 1600 meters above sea level in the Vayots Dzor region, and to recuperate centuries old abandoned vineyards. A story of tenacity that now firmly places Zorah Wines on the world map of wine producers. 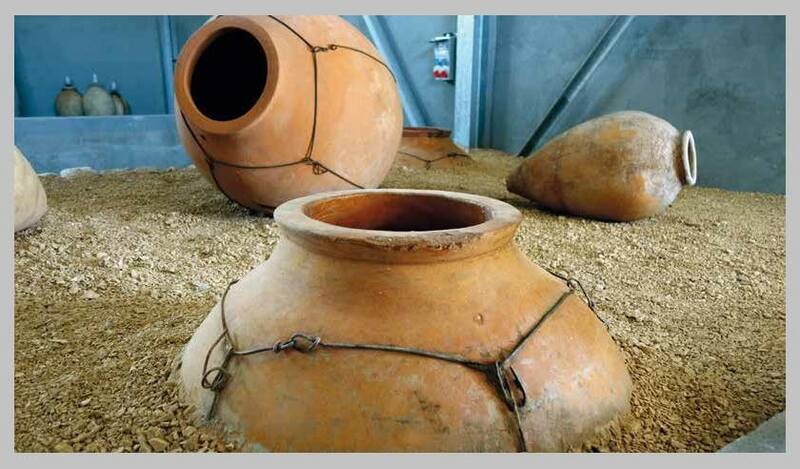 In their wine cellar there are 30 terracotta wine jars called Karasi, all are old used jars. They were found by Zorah by painstakingly searching from village to village and were successively restored to their original use as vessels for making wine. A Guest at “Terracotta and Wine 2016”, Zorah Wines has said about the International Convention at Impruneta: “It is one of the events that is perfectly suited to our philosophy, because it attracts an educated audience open to new ideas and appreciative of traditions. Which is exactly our DNA: modern while respecting tradition”. Zorah Wines uses the grapes from 200-year-old indigenous vines. How are they grown? Areni has always been planted directly on its own rootstocks and not grafted, because the phylloxera aphid is unheard of in this area. The grapes have a thick skin that protects them from the extremely strong sunlight that occurs during the ripening season. In fact, our vineyards are at 1,400 and 1,600 meters above sea level and we have daily temperature excursions that are on average 20° C. We planted the vineyards at 1,400 meters above sea level in the early twenty-first century after a meticulous mass selection. From this vineyard we make “Zorah-Karasi”. We also purchased and revitalized small vineyards at 1,600 meters above sea level with centuries old vines that had been abandoned because of their location lost in the mountains they were difficult to get to due to the absence of roads. 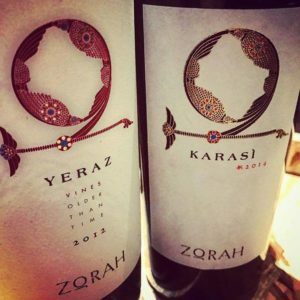 These varieties being so old have little yield and from the grapes of these vines originated our Cru wine “Zorah-Yeraz”. We must take into account that during the Soviet period, Armenia was appointed by Moscow as a country that had to produce Brandy and Georgia had to make wine. This format dictated from Moscow has no logic, however, the fact remains that the Armenians throughout the Soviet period (70 years) have concentrated their production in making Brandy. Zorah is the first Armenian project that has firmly believed in the Armenian native grapes and with the use of our amphorae, which have a long history in our country, we wanted to place Armenia on the world map of wine producers. The philosophy of Zorah is to make high quality wines and raise awareness of the history of wine and the Armenian amphora. Armenia is not a country that has been improvised to make wines. The oldest winery in the world the “Areni-1 Cave complex” which dates back to 6,000 years ago, is located in Voyots Dzor in Armenia, and happens to be right in front of our winery and our vineyard, on a purely coincidental proximity, as the site was discovered in 2007, years after we had already planted our own vineyards”. How does the fermentation and aging of Yeraz take place? “Fermentation takes place in rough untreated concrete tanks, using only natural yeast, while the wine is aged in traditional wine-jars of various sizes for at least 24 months with a final passage in large un-toasted barrels in order to soften the tannins. Then we proceed with a further aging in the bottle for another 12 months”. In your experience, how does the amphora help to highlight the grape’s characteristics? “The amphora does not take away or add anything to the wine. The miracle of the amphora is to make the wine feel at home, cradling the liquid, making it live and breathe to be able to mature. Wine aged in amphora is the faithful representation of the vineyard and its terroir. 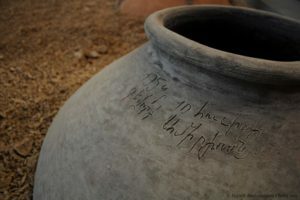 The use of amphorae for Zorah is a tribute to the old tradition of amphorae in the “Areni -1 cave complex” so close to home and a source of constant inspiration: “It embodies Zorah’s desire to make wines in a natural idiom, the intangible sense of using something moulded out of earth, a living, breathing vessel to cradle and nurture the living liquid. Just as the soil shapes the vine, the clay shapes the wine”. Where do the jars you use come from? “Unfortunately, in modern Armenia amphorae are no longer produced. To find our jars we had to go from village to village, knocking on doors and asking around. In Armenian villages the amphora has always been present and almost all peasants have always had one in the house. However, in the 70 years during which Armenia was part of the Soviet Union, for the reasons explained, the production and the interest in amphorae slowly dwindled. The next Zorah project is to create a pottery school in our vineyard (where we hope to involve Artenova) to revitalize our tradition of amphora making, which dates back thousands of years. 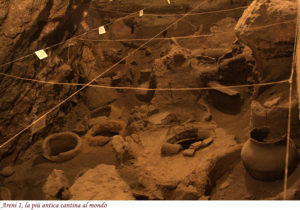 In the cave of “Areni -1 Cave complex” wine was made in terracotta amphorae, and this is not the only testimony of the practice in Armenia. There are several archaeological sites, which confirm that the amphora has always been present in Armenia. In our cellar we have about thirty amphorae of various sizes from 200 to 1,200 litres. We conduct experiments: part of the jar is buried and a part is left out of the ground. In Armenia in different historical moments, amphorae were sometimes either buried or left above ground”. What are the differences between the ones you use and the wine-jars made by Artenova? “The shape, the type of clay and the thickness are definitely different”. Is it true that in Armenia wine jars are buried in very sandy soils, without inner lining? How do you protect them? “Our amphorae are buried in a bed made with the earth and stones from the vineyard. Our soil is chalky, full of stones and with a top layer of sand. As I explained our jars are old, so do not need inner linings”. Apart from Zorah Karasi and Yeraz Zorah, do you make other kinds of wine in amphora? What feedback are you getting? “In addition to Zorah Karasi and Zorah Yeraz we have our wine white, Zorah Voskì which is the result of two native Armenian grapes: Voskeàt and Garandmak. 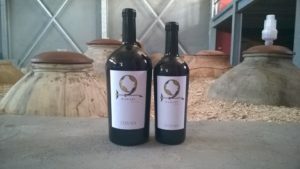 This wine, however, is made in concrete tanks. We have been on the market with our wines since 2012 and after only a few years we are able to serve 20 countries today and the demand is always greater than our production. But, as I said, our philosophy is quality, we prefer to grow slowly and in each market, we serve only the enthusiast part, made of people seeking new sensations. In Italy we export through “Cuzziol GrandiVini” with whom we are very pleased to work”. We have participated in “Terracotta and Wine” since the first edition in 2014″. What do you think of the event and how did you find out about Artenova? “Terracotta and Wine “is one of the events that is perfectly suited to our philosophy because it attracts an educated audience that is open to new ideas and appreciates traditions. That is exactly our own DNA: modern while respecting tradition. Artenova was introduced to us by oenologist Francesco Bartoletti to whom for this, we are very grateful “.